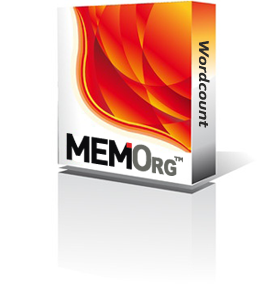 MEMOrg Wordcount is an automated tool designed for the translation market. Counting the text in your documents has never been easier! Not to mention you can use it for free and saves you a lot of precious time! You simply send your documents to our server and automatically receive the Wordcount report via e-mail. That’s it! You don’t do any manual computations, any file manipulation, or any conversion. Just send your documents and receive the report. The Wordcount report that you will receive contains information regarding the number of words, characters, letters, and digits in each file as well as for the entire batch of files. Receiving a report: The report is automatically sent to your registered e-mail in PDF and/or HTML formats as per your request. All reports are saved and accessible through your account. Confidentiality: All documents are automatically deleted from our server 7 days from your transmittal. No file will be accessible by any other person. All operations on your files are performed automatically. Installation: There is no installation required on your computer. All processes are performed on our server. How to get access: Wordcount feature is available by default to MEMOrg registered users. Don’t have an account yet? Sign up here and then navigate to File Manager menu.